A South African safari is a common item on most travel bucket lists, but it’s not always an easy goal to achieve. 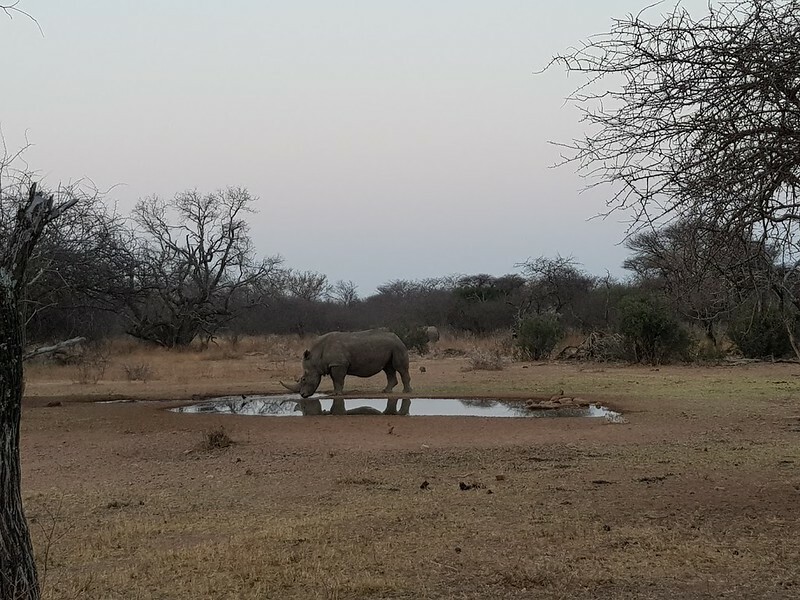 However, today’s guest contributor, Sophie Kate Baker, is here to tell us how travelers with scheduled layovers in Johannesburg can make the most of their time by visiting the big five at the beautiful Dinokeng Reserve located nearby. A lioness looks on as her cubs feast on a Wildebeest carcass. There’s nothing more uniquely African than a safari experience. If you’re flying to Africa, chances are your trip might include a stopover at Africa’s busiest and biggest airport; OR Tambo International airport in Johannesburg. When you’re on your way to the beautiful Western Cape, en-route to a beach getaway in Zanzibar, or want to explore the cultural hub of Lagos, Johannesburg can be easily overlooked. Not anymore! To make use of a long stopover, boomers who find themselves at OR Tambo with some time to spare can take a drive of less than an hour and find themselves gazing at lions, having dinner overlooking a beautiful watering hole, and finishing the day with sundowners in warm weather over open plains, all to the soundtrack of the African bushveld. Two blue wildebeest tussle in the road. 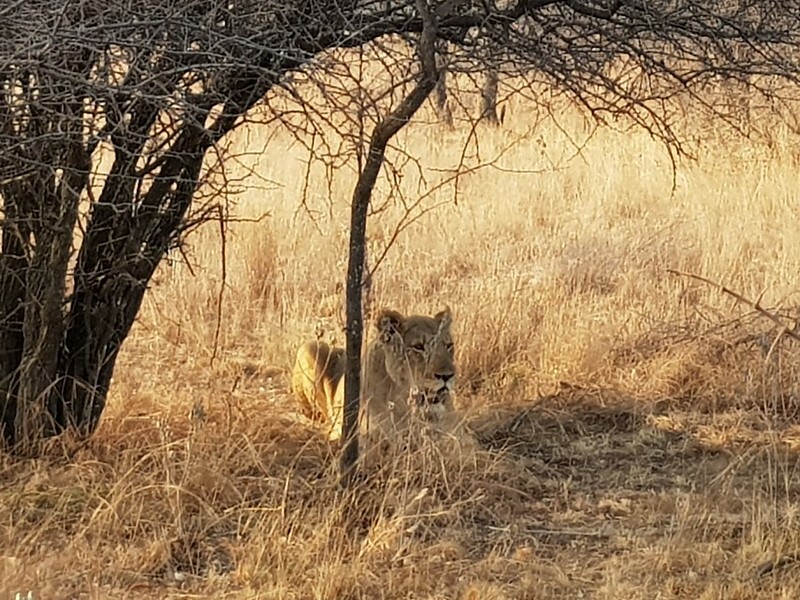 The Dinokeng Game Reserve is situated just outside of Pretoria, only an hour from OR Tambo, and is Gauteng’s first free-roaming Big Five reserve – meaning that it’s home to lion, elephant, buffalo, rhino and leopard (on top of plenty of other animals!) roaming free in their natural habitat. 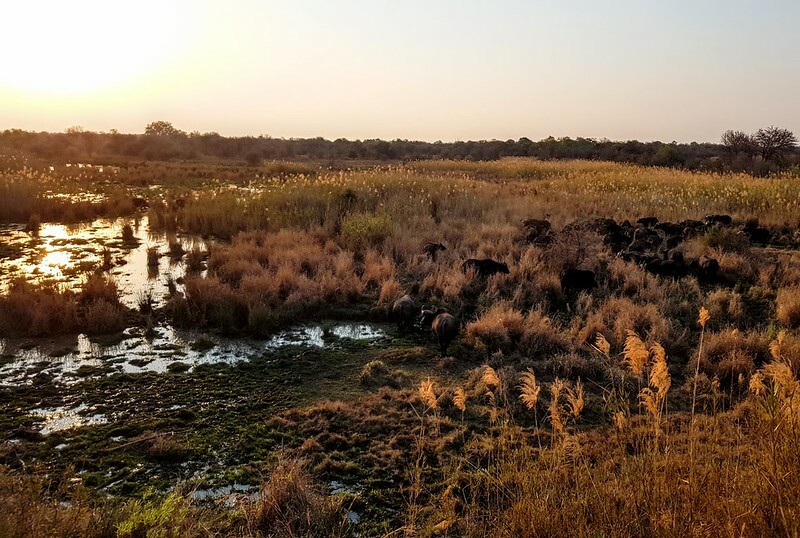 The reserve offers a self-drive route for stopovers of less than a day, but if you have time to stay overnight, you can opt for one of the many lodges within the reserve to relax, refresh and get your African trip off to the best start possible. Mongena game lodge is a four-star fully catered lodge with its own private driving routes accessible only by game vehicles, and is one of the bigger and better-known accommodation options within the reserve. When you arrive at the thatched reception area and cross you’ll find zebras and nyala wandering around the lodge, quietly grazing within meters of your chalet’s front door. The nyala buck roam free around the grounds of Mongena game lodge. Because the rand is quite a weak currency, South Africa is a travelers dream. 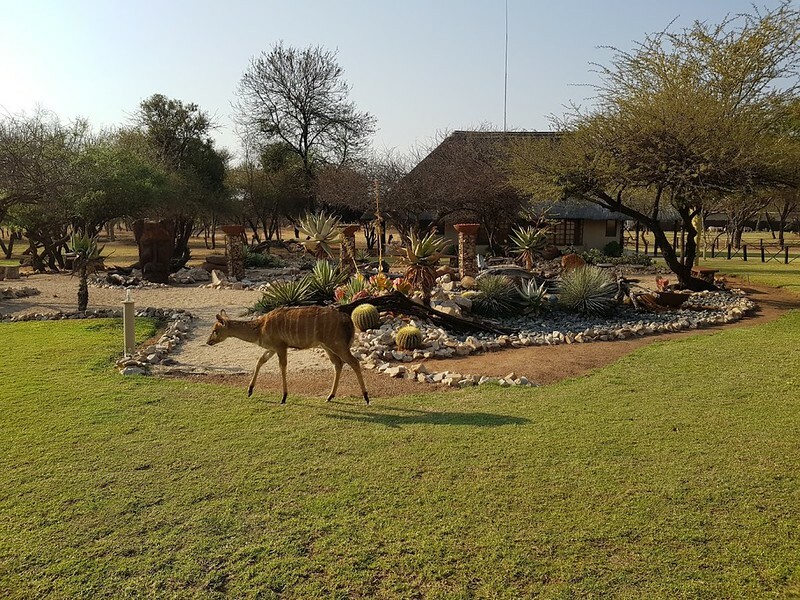 Dinokeng is one of the most affordable game reserves in the country, so you can afford to go for the luxurious options when you’re staying there. Rates for dinner, bed and breakfast start from $101pp per night at Mongena and you can expect top-notch cuisine and cushy accommodation. Other four-star options include Leopardsong game lodge, Mangwa Valley Lodge and Spa, Halfway There Lodge and Ngata Safari Lodge. Ngata even offers an authentic Texas-style smokehouse! The must-do activity to get the most out of your stay is a game drive (as many as you can fit in!). 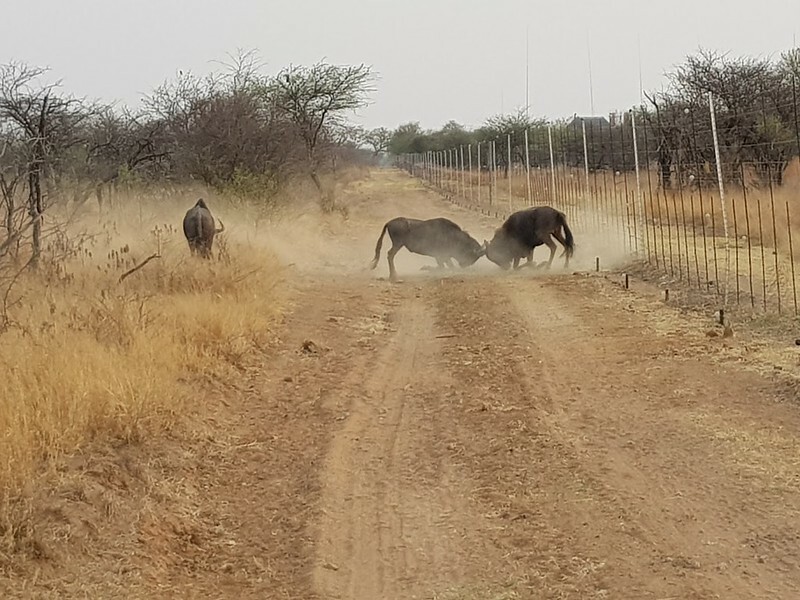 You’ll rumble down dirt roads in an open safari vehicle, your ranger feeding you information about birds, buck, small game, trees and the local wildlife. These rangers are some of the most passionate people you’ll ever meet and are a wealth of information, so don’t be afraid to ask questions. 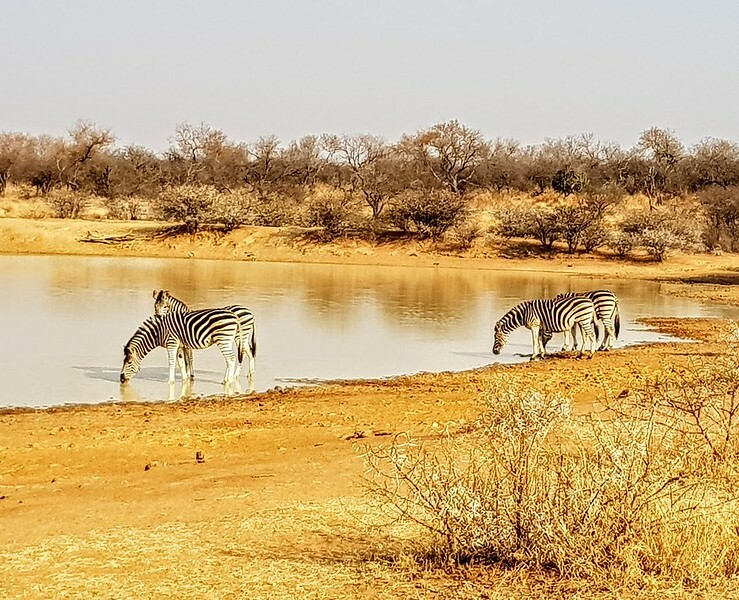 Zebras on a tea break at one of Dinokeng’s watering holes. If you want to get the best game viewing, brave the early morning for the 6am or forsake the afternoon nap for 4pm game drives when the weather is a little bit cooler and the animals are at their most active. Halfway through, a coffee or drinks stop lets you stretch your legs and get to know your fellow game drive companions a little better while you take in the smells and sounds of the bush. Our morning stop involved steaming coffee on wooden viewing deck jutting out into a large swamp. As I swallowed my first mouthful of coffee and rusks (a true South African breakfast food that you cannot skip! ), a 30-strong herd of buffalo shot out of the reeds in quick succession after unwittingly coming across a lone hippo. On the evening stop, a giraffe stood a few meters away, curiously looking at our dried mango strips and eventually deciding that investigating further wasn’t worth the effort. A herd of buffalo play in the reeds. For the more active and adventurous among us, a guided bush walk is an option that might appeal. The bush almost envelops you, but you’ll need nerves of steel if you do come across some of the Big Five, because you’re up close with nowhere to hide. White rhino bulls are typically solitary animals. You aren’t guaranteed to see anything on either the game drives or walks as the nature of ‘free roaming’ means that the game rangers and trackers never know exactly where the animals are, but they will do their absolute best to find them for you. The payoff is that when you do stumble upon a herd of elephant or pride of lion tucking into a freshly hunted Wildebeest, you’ll be struck with a sense of amazement that these enormous, awe-inspiring animals have allowed you a glimpse into their daily lives, not forced to serve as entertainment for visitors who just want to tick everything off their list. And then you’ll wonder why you ever thought that anything other than a night in the bush was a good option on your OR Tambo stopover. Looks incredible, doesn’t it? Have you explored Johannesburg? Come join the conversation at the My Itchy Travel Feet page on Facebook. Or send us an email with your thoughts.